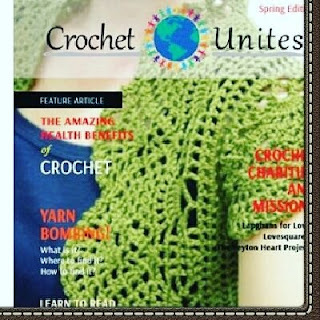 One of my crafty friends, Catherine Peacher, from just up the road from me in Kingwood, Texas has just launched her magazine Crochet Unites, with the Spring Edition available this week. Hurray and congratulations to Catherine! I met Catherine totally by chance via Craig's List, the US equivalent of the UK's Gumtree. Close to two years ago I was randomly looking at Craig's List. I've never advertised or bought anything there and have only visited the site a handful of times since moving to Texas. But for some serendipitous reason I searched for "crochet" and found Catherine seeking a partner to start a crochet business. Of course, I had to call! We met at a Starbucks half way between our homes and became firm friends. How could we not with our shared love of all things crochet?! I didn't become Catherine's partner because after deep reflection I felt that I couldn't devote the time to building a second business from scratch as I had with TG Research, my primary business but we stayed in touch. I helped Catherine out when I could mainly with encouragement and brainstorming ideas!